The final day and hopes were high. Stirling & Clackmannan were to play Midlothian in the first match. S&C had won one match and halved another and a win against Midlothian might give them the title depending on the outcome of the other match. A Midlothian win would give them a clean sweep on their way to retaining the title. The morning foursome gave Midlothian the edge with a 2-1 lead. The afternoon singles however were a clean sweep for Midlothian. Meanwhile in the second match East Lothian played Fife. Having lost their first two matches Fife were keen to avoid the wooden spoon. East Lothian hoped for a win to perhaps secure second place or even a three way count back for first if S&C won! 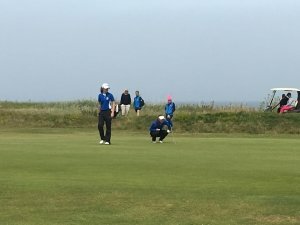 Those hopes were dampened as all three of the morning foursomes games went to Fife. As the afternoon play got under way, the mist which had been hanging around over the water all morning started to roll in and jackets and waterproofs were donned as protection from the cold east wind. It was soon clear that it was going to be difficult to secure the five games in the singles needed to win the match and indeed the Fife team came good for their captain on the final day. East Lothian’s hopes for points as the players played to the gallery at the 13th rested with three games. Joanne Free went on to win 4&3 over Jocelyn Mackie. Jill McNicoll must have hoped to win a the hole when Hannah Braidwood pushed her drive way right onto the middle of the 14 fairway. Hannah played a wonderful long shot over the edge of the hill to the left hand side of the green. A long straight put and a tap in gave her a par. Jill’s ball lay just off the green on the right between the bunkers. An awkward putt uphill over the edge of the bunker came up short and the second wandered off leaving Jill with a 5. Jill fought on but went down 3&1. In the last match Kay Lannin and Brogan Clark went dormie 5 in Kay’s favour at the 13th. As the sun eventually burst forth the 14th and 15th both went to Brogan. Although her first putt on 16 rattled the pole as it went past a half in par was enough to ensure a win for Kay. Midlothian retained the title and will go forward to represent the East Division in the Scottish finals at Kilmacolm in September and we wish them luck. Dunbar was in great condition but sadly East Lothian could not convert home advantage into a home win but we will be back next year at Ladybank keen for a better outcome. A few moments from this afternoon, congratulations to Midlothian on a well deserved victory. 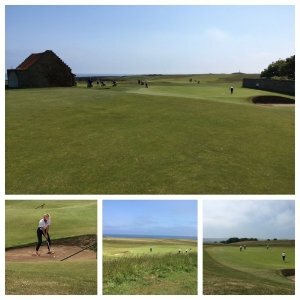 Thank you to Dunbar for a wonderful welcome and a course that the players would love to play again. 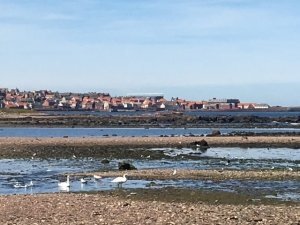 Dunbar was looking absolutely stunning this morning for the morning foursomes. A slight haar keeping the temperature down slightly compared to the reportedly boiling temperatures inland. Not so Sunny Dunny for the second day of competition. The scores for the day are posted. The First Match of the day was the match between Stirling & Clackmanan and Fife. S&C got off to a racing starting the Foursomes claiming all three games. In the afternoon singles games a few more bounces went Fife’s way and they managed to win three and half a fourth. 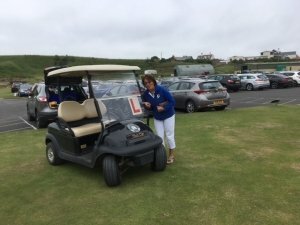 Jill’s dad George McNicoll obviously thought Jenni needed L plates too and arrived with one this morning for the buggy. East Lothian took on Midlothian in the second match. The first two matches were tight and could have gone either way but Louise Fraser & Hannah Darling proved the steadier pair taking the first point 3&2 from Jill McNicoll & Alyssa Balding. Kay Lannin and Dawn Young in the last game struggled against Karen Fergusson Sneddon & Caroline Steedman. The middle game between Alison McBride & Kate McIntosh and Joanne Free & Lesley Atkins kept us in suspense all the way to the 18th and a halved match. First game in the afternoon was between the two “Juniors” Hannah Darling and Annabel Hosie. An on form Hannah quickly took the upper hand. Joanne Free bounced back from the morning with some great golf to secured the first win of the afternoon for East Lothian. The third game could have gone either way but the very steady Karen Marshall payed a great short game to see off the challenge of Lesley Atkins. Jill McNicoll fell victim to too many bunkers in her defeat at the hands of Caroline Steedman. In an up and down game Alyssa Balding nudged ahead of Alison McBride again in the closing holes and a par on the last hole was sufficient to secure the game and another point for East Lothian. In the final game Kay Lannin was up against Louise Fraser. This time it was the turn of Louise to find a series is hole allowing Kay to stretch her lead to 4 at the turn before being pegged back to 1. Leaving the 13th green her caddy, Dawn Young decided to take out your captain with a runaway trolley but your captain is made of stronger stuff and the trolley came off worst landing on its side, shed its bag and battery and Kay’s snack. Kay kept her calm and a birdie put her to 2 up playing the 16th. A mass of supporters and a buggy may or not have influenced Kay in taking a slightly left approach to the green but a well judged bounce of the perimeter wall gave her the chance for a birdie 2 and a 3&2 win. Dawn may get the L plate tomorrow! 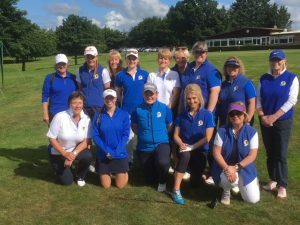 “Sunny Dunny” lived up to its name and after practise rounds in glorious sunshine on Sunday the four County teams met this morning in the sunshine for the first day of the formal matches. First match out were East Lothian v Stirling and Clackmannan. Joanne Free and Lesley Atikins led the way almost securing the first point at the 15th but an awkward bunker shot determined otherwise but there was a shaking of the hands at the 16th and the first point on the board. In the last game Jill McNicoll and Alyssa Balding were nip and tuck in a tight match with Laura Bisset and Alison Davidson which ended in a win for S & C at the 17th. All attention now focused on the middle game with the two newcomers to the team, Kay Lannin and Annabel Hosie nudging ahead at the 17th. A raking putt from Annabel on the 18th secured the win. East Lothian went into lunch one point ahead. The afternoon games opened with Joanne Free against old rival Louise Macgregor. Joanne trailed 2 down through 11 and an uncharactaristic wild drive at 13 left her on the edge of the 14th fairway. In a Houdini moment she flew her 2nd shot blind over the 14th tee onto the green. Still trailing she changed gear at the 15th driving past the pin and sinking her putt for a brilliant eagle followed by a par, par, birdie finish for a 1 up win. 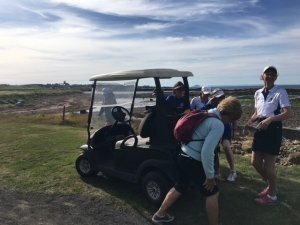 Pam Hall struggled against a big hitting Jennie Allan into a strong east wind compounded with an unlucky bunker experience at the 11th meant she was up against it. It was easier to compete with the wind behind her on the way back but the gap was too big and she ran out of holes. In the last 2 games a slightly wayward Alyssa Balding quickly went 3 down and while she cut that to 1, the holes slipped away from her again. Meanwhile Kay Lannin playing some lovely golf found herself up against an in form Alison Davidson and her game ended early too. All interest now centred on the middle games. The respective captains raced ahead to the 18th unsure whether Dawn Young and Fiona Wait were putting out for a win or a half. Both parred the hole for a halved match. The game between Jill Mc Nicoll and Alison Goodwin had been swinging back and forward all the way round. Jill was one up and unaware of the result of the matches ahead of her. Pars from both players secured the much needed win for East Lothian and a tied match overall after day 1. 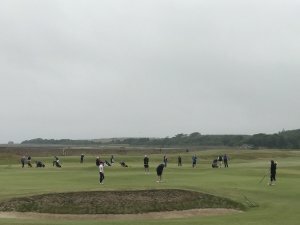 The Midlothian v Fife Matches were close in the morning foursomes till the turn when the matches started to swing Midlothian’s way. Fife held on to claim a half point at lunchtime. Up against it from the start of the singles they secured two wins in their 6.5-2.5 defeat by the current champions. Plenty to play for tomorrow. We hope that we will see some of our members at Dunbar to support the Team. Some people ask what the Jamboree is all about so here goes. The Jamboree or the East Division Inter County Championships to give the event its full title involves ladies teams from East Lothian, Midlothian, Stirling & Clackmannan and Fife. There are 8 players in each team and with each captain selecting 6 to play in 3 foursomes matches in the morning and 6 singles in the afternoon. Ryder Cup style the captains meet at the registration desk prior to each set of matches to compare their team/pairings playing order for the matches. The matches are all played off scratch. The winners over the 3 days will go on to represent the East Division in the Scottish Finals at Kilmacolm in September. There will be some great golf and hopefully the weather will be kind to us. Many of the players know each other and enjoy renewing old friendships and making new ones. All the players however are very proud to be selected to play for their County and there is great team spirit and a desire to play well for themselves and for the team. ELLCGA was originally formed in 1924 with the principal aim of entering a team in the Inter County Championships and the rest of the events, which have varied over the years, were and still are intended as fund raisers to support the team. The Championships were originally home and away fixtures and Forfarshire was at that time part of East Division. 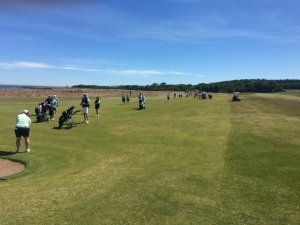 In the first year of East Lothian’s participation the teams played on amongst others Carnoustie and Muirfield. The current format affectionately known as “The Jamboree” was introduced in 1974. There was a recognition that it made sense in terms of time and costs for the matches to be condensed into a single three day period. The first East Division Jamboree was held at North Berwick. 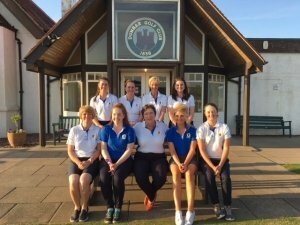 While East Lothian had qualified for the Scottish County Finals in the past the first successful run in qualifying for the County Finals was 1978 -87 when we qualified 7 times in 10 years. Winning the finals was rather more elusive with a win only at Stranraer in 1978. It was the period 1990-9 when East Lothian were the team to beat. Not only did they reach the finals 8 times they won the Shield 6 times including in 1999 at Gullane in their 75th year. We last made County Finals 4 years ago when the Jamboree was at North Berwick and we hope to make use of the home advantage to make it again this year. Day 3 was dry though on the cold side. East Lothian and Fife would play for the wooden spoon and Midlothian and Stirling & Clackmannan for the trophy. At the end of the day Midlothian retained the trophy playing excellent golf to beat Stirling and Clackmannan 7-2, Third place went to Fife who beat East Lothian by 5 .5 -3.5 . We may have collected the wooden spoon but there was some excellent golf played on both sides. 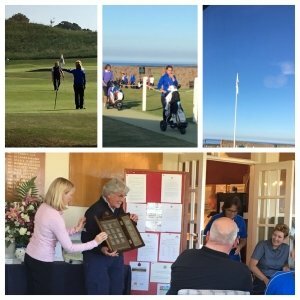 In the morning four balls we were treated to three games which all went to the 18th with Fife the winner of 2 matches to East Lothian’s 1. Regular foursomes partners Hazel and Mary Lou eventually finding the win which had eluded them in earlier matches. The new partnerships of Jill and Lesley and Lauren and Alyssa worked very well together but both were pipped at the post. The afternoon singles matches saw some interesting matches with the balance swing one way then the other. Lesley in the first match was 6 down against old rival Elaine Moffat but fought back before going down 3&2. An in form Jo Mackie unfortunately for us romped home against Stacey to be followed shortly by a 6&4 win for Anna McKay against Alyssa. At one point Alyssa was 4 down despite being only 2 over par which gives an indication of the challenge. The back end of the draw faired better with Pam nudging ahead in the second half and managed to hang on for a half and our first points in the afternoon. This was followed by a 1up win for Lauren after a match that had swung back and forth. The last match followed them down the hill but Jill had already come from behind in the first half to secure a 4&2 win ending the afternoon on a high note. All the matches this week have been played in good spirit. There has been some great golf from our team and they have come away positive about their golf and having enjoyed the week. The other teams were just that bit stronger and produced more birdies (and the odd eagle!) than we did. It was also good to see a number of very talented young players coming throughout all the counties. Next year Dunbar and links golf on home territory! Day 2 started wet and miserable but the greens were still playable and the pin placements selected were intended to avoid the problem of flooding greens. In the end the weather changed a little and we did not have the heavy rain and winds were not as strong a previously forecast, it was still wet but not as bad. The team enthusiasm was not unfortunately converted into points and Stirling and Clackmannan had the benefit of home knowledge as well as in form players. 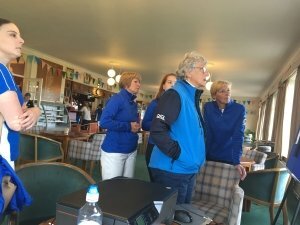 Lauren & Lesley could not quite find the form that gave us such an exciting finish to Day 1 foursomes and while Jill with new partner Pam and Hazel and Mary Lou put up good fights we went in to lunch 3-0 down. In the afternoon singles, Stacey Cameron fought back from 3 down at one stage only to lose at the 17th. Lauren also fought back to close the gap but her game also ran out at the 17th. Hazel found herself out gunned. Alyssa started well with a birdie at the first hole as she had the day before but could not maintain the the charge. 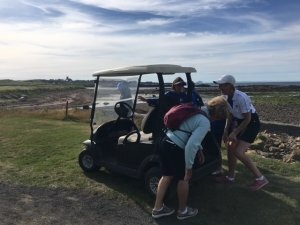 Jill and Mary Lou were on the back foot from the start of their respective matches though Jill rallied and managed to take her match to the 16th. Fife were also well beaten by Midlothian (1-8) so we enter Day 3 fighting to avoid the wooden spoon but not down hearted. Day one started bright and sunny and the team mood matched the day. The opponents for the day were Midlothian. All the matches were of a high standard and some of the results do not always reflect the quality of golf played by both sides. In the morning foursomes Mary Lou and Hazel found themselves up against it despite playing steady golf. A few putts hitting the cup and bouncing out or sitting on the lip being all the difference at many holes. In the lead match Lesley and Lauren played some adventurous golf but recovered well to hang in to square the match on the 18th. In the afternoon singles Stacey lost out to a fine short game display from Midlothian’s Louise Fraser. Lesley showed determination again to secure a win at the 17th despite losing the 13th to an eagle. Pam played a fine par game only to find that her 14 year old opponent Hannah Darling preferred to play birdie golf rattling in some raking putts as well as hitting a long ball. Team newcomer Alyssa was nip and tuck till the second half when Karen edged ahead . Mary Lou managed to keep just ahead till till Caroline Steedman hit an eagle 2 at the 16th to square the match before a fine finish from Mary Lou secured a win at the 18th. A slightly off form Jill fell victim to a great display from Karen Marshall. Still 2 rounds to go and the team are looking forward to the challenge ahead. The annual East Division Matches popularly known as the Jamboree will be held this year at Stirling GC from Monday 26th to Wednesday 28th June 2017.